Home / Can a Lamp Change Your Life? Can you LOVE a Lamp? Well, maybe. I have been in love with Koncept lamps for over a year now. They really are life changing. They are super sleek, aka not ugly! Complete with dimmer switch, now that’s just cool! And most importantly, perfect for needlepoint. First we have the clamp on lamp. We stock it in Metallic Black. With the addition of the lamp/accessory adaptor (sold separately) from Needlework System 4, this will attach easily and happily to your System 4 floor stand. The arm articulates and moves every which way to get it right over the area you want to stitch. Each section of the arm is about 14″ so you have a nice long reach. The light is a cool white which is my favorite for stitching. I think it gives you the truest colors. With the built in dimmer switch you can adjust the amount of light you want for the area you are stitching. This is a great light to travel with, just collapse it down and you are ready to go. It doesn’t take up much room in your suitcase or tote. Next we have the table variety. These are available in lots of fun colors to match your decor. Black and silver come in cool white light, the bright colors only come in warm white light. Warm white light is the typical light you see from a light bulb, but so much brighter. The base is weighted so it won’t tip on your table. Now, here’s the cool part. 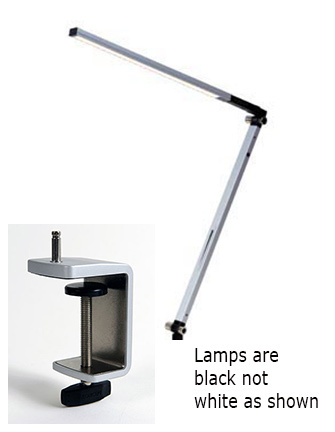 The lamps snap off their base and can be attached to the clamp (sold separately). Voilá, a travel lamp. Now you have a lamp that will sit by your chair at home plus be on the go to classes with you. Pretty cool! Last but not least, we have the floor lamp. Sit it by your chair. It takes up little to no room. Great for stitching or reading. It will virtually disappear, until you need it that is. Metallic black finish with cool white light. There you have it, the light loves of my life! If you would like to order you can do so online or by calling us at 410.296.0405. To my shopowner friends, yes, we offer these wholesale too!